show remarkable resolution that approaches the theoretical limit for an 8 meter telescope. In this Gemini Near Infrared image the young planetary nebula known as BD+303639 is glowing in the light of hydrogen, the most abundant element in the universe. BD+303639 is about ten thousand light years from the Earth in the direction of the constellation of Cygnus. A few million years ago BD+303639 was a star similar to our sun, but since then it has evolved, first into a "red giant", and then more rapidly into the planetary nebula seen today. In the "red giant" phase, the center of the star heats up and drives off its outer layers. In the subsequent Planetary Nebula phase, the ejected material is heated by ultraviolet radiation from the hot central star until it begins to glow. In a few tens of thousands of years (a short time by astronomical standards) the ejected material will be dispersed into the interstellar medium and the central star will slowly cool and eventually disappear. 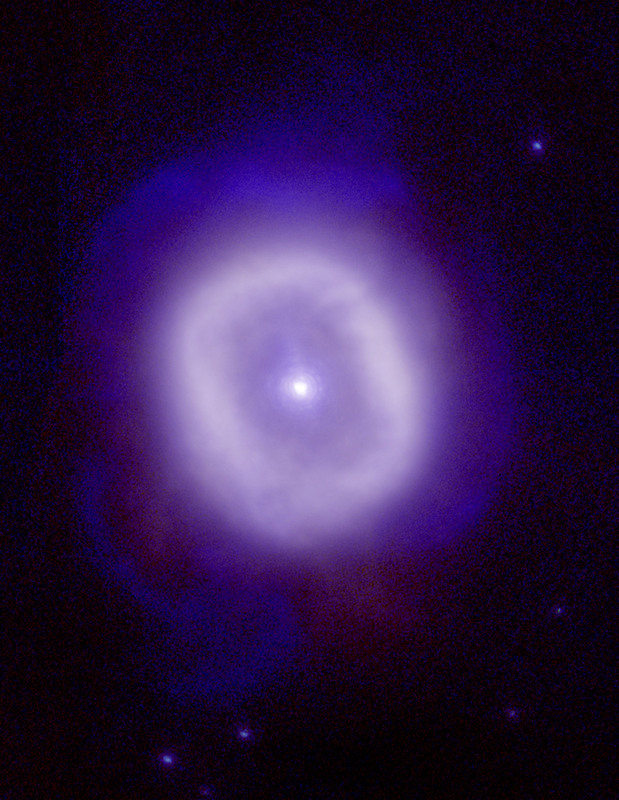 The bright box-like ring seen around the central star is due to emission from hydrogen in the material ejected during the red giant phase that has already been heated by the central star. This enormous shell would completely envelop our planetary system, being approximately one hundred times larger than our solar system. An unusual feature of this planetary nebula is the outer fainter and more wispy emission from molecular hydrogen. This larger shell of ejected material has yet to be broken apart by ultraviolet radiation from the star. The wispy structures visible in the light of molecular hydrogen reveals information about the extent of the ejected material and further details about the dynamic processes involved in recycling material from stars back into interstellar space. The sharpness of the star images, particularly apparent for the fainter stars around BD+303639, approaches the best image quality achievable with this size telescope at these wavelengths, promising a rich future of superb images from the Gemini telescopes. This image was taken by the Gemini North 8-meter telescope on Mauna Kea using the University of Hawaii's Adaptive Optics system called Hokupa'a. Adaptive Optics systems use deformable mirrors to correct for the effects of atmospheric distortions to starlight, resulting in significantly sharper images. It is expected that Adaptive Optics will allow Gemini to at times produce sharper images than is possible with the Hubble Space Telescope. The United States National Science Foundation has provided significant financial support to the University of Hawai'i Adaptive Optics Program to obtain these images.